Q: How do you make a cow bark?!? A: You return home at 4AM. Lots of nice news today, some cool, some funny and some weird. For starters, the smiley : – ) ( 🙂 )is 25 years old. Happy birthday! 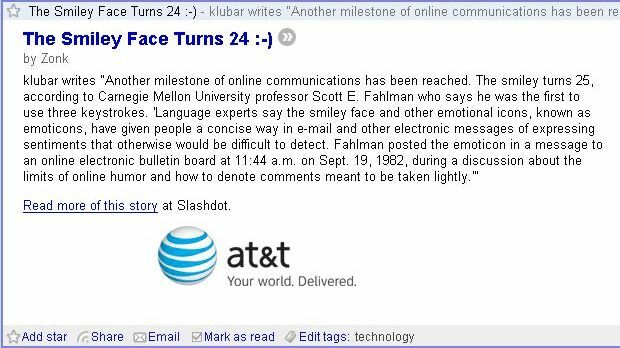 According to Slashdot professor Scott E. Fahlman from Carnegie Mellon University was the first one to use the three characters to point out a happy face, and since then, everybody uses them. Sounds cool huh? well, the funny part in this is the misspelling on Slashdot, corrected now, but my RSS reader caught it just in time! Google finally released the long waited presentation feature in their office suite, and I can definitely say they did a great job. Check it out on http://docs.google.com. This entry was posted in english, links, news, publicitate gratuita, rant, review and tagged bar, Happy Birthday, marius by .marius. Bookmark the permalink.